Matt C: There are a few books on the list this week, and I could take this opportunity to gab on about the latest issue of Wonder Woman or perhaps the sophomore instalment of Black Monday Murders, but this time around I'm going to shine the spotlight on a new series that I feel really deserves your attention: Hadrian's Wall. Kyle Higgins, Alec Siegel and Rod Reis last worked together on the criminally underrated C.O.W.L., the 1950s set tale that mixed superheroics with political corruption to thrilling effect - we trumpeted its brilliance here but sadly it didn't generate a sizeable enough audience to ensure its continuation. It was a major bummer when it disappeared but I'm enormously pleased to see their collaborative storytelling well hasn't dried up and they have much more to offer. This series, described as an 'intergalactic noir', is finite, with eight issues planned, so it does guarantee we're not left with any plot threads dangling. Take a look at some of the preview art here if you need further convincing as it kind of makes the case for adding it to your pull-list itself. If you missed out on C.O.W.L. then make sure you don't miss out on this. And who knows, if it does well enough perhaps Higgins, Siegel and Reis may head back to the world of C.O.W.L. for further adventures? Tom P: First up for me this week is Black Science which reaches issue #24 and shows no signs of fatigue, continuing to race forward as, after years stranded in the multidimensional Eververse, the Dimensionauts return home. I can't wait to see what they find. 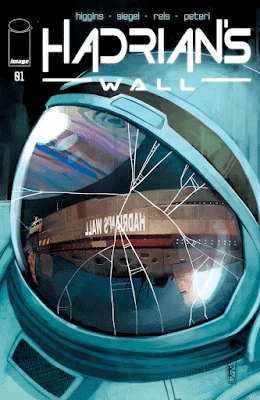 Hadrian's Wall #1 is hot of the press from the excellent creative team behind the critically-acclaimed series C.O.W.L. I first picked up in trade on the recommendation of our editor Matt C and it quickly became a firm favourite on my pull-list. I was sad when the series came to an end so I was pleased when I heard this new series was coming to Image this week. The premise: an astronaut is found murdered on his ship and a detective is sent to investigate as it threatens to spark an interstellar Cold War - sign me up for this science fiction, 'locked room' murder mystery!